Picture a framework for portfolio construction that empowers clients to stick with a plan across ever-changing market conditions. With combinations of low-cost passive, strategic beta, and actively managed strategies, our building block approach adapts to fit a range of client risk appetites and likely investor behaviors. Our ABC asset allocation framework can help you implement personalized portfolio solutions that are easy to explain to your clients and centered around your desired time and comfort level with managing investments. Narrator: Investors are on a personal journey. For advisors, there's a lot to consider when helping clients choose a portfolio path. Goals, biases, appetites for risk. It can be difficult to cover with limited time. What if constructing portfolios were a straightforward process? What If it could be as simple as A+B+C? We've developed a low-cost asset allocation framework that can be adjusted for complexity and risk preferences and save you valuable time. Because this is about building relationships that last. Helping advisors build personalized portfolios that clients can understand and stick with, through all kinds of seasons, week to week, month to month, year to year. Behind the science and math, simple elements come together to form a straightforward framework. One that you can adapt, flex, and stick with through all seasons. By offering clear pathways that are designed to be tailored to individual needs and tendencies, complexity gives way to simplicity. This is our straightforward approach to portfolio construction: one that lets you build for staying power. ©2019 Charles Schwab Investment Management, Inc. All rights reserved. 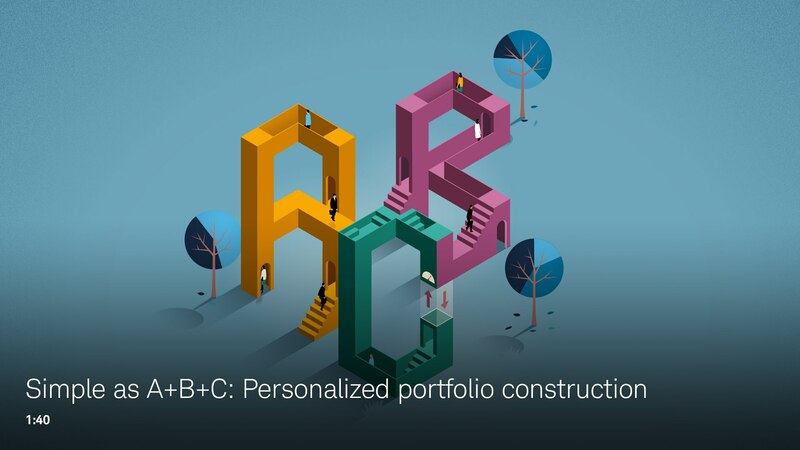 This ABC framework can help deliver a diversified, low-cost core allocation and add degrees of portfolio complexity when it makes sense—all in an easy and scalable way. *Illustrative efficient frontier. Underlying investments under A (market cap), B (styles and strategic beta) are assumed to be represented by low-cost ETFs or mutual funds, and investments under C (active) are assumed to be represented by actively managed mutual funds with relatively higher operating expenses. To learn more about our ABC asset allocation framework and how you can implement it in your practice, contact your Charles Schwab Investment Management representative. Our straightforward, building block framework utilizes a behaviorally based approach to encourage positive investor behavior and help clients stay the course. Combining fundamentally weighted strategies with cap-weighted strategies may improve a portfolio's risk-return characteristics. Due to rampant proliferation—especially in newer multi-factor ETFs—strategic beta requires new dimensions of evaluation to tackle the growing challenges in portfolio implementation. Information provided here represents Charles Schwab Investment Management's emerging thoughts on portfolio construction. Nothing should be construed as a recommendation or considered an offer to sell or a solicitation to buy any securities. This information is provided for illustrative purposes only and should not be considered personalized investment advice. You should not buy or sell any investment without first considering whether it is appropriate for your client based on his or her own particular situation. Charles Schwab Investment Management, Inc. (CSIM) is the investment advisor for Schwab Funds and Schwab ETFs. Schwab Funds are distributed by Charles Schwab & Co., Inc. (Schwab), Member SIPC. Schwab ETFs are distributed by SEI Investments Distribution Co. (SIDCO). CSIM and Schwab are separate but affiliated companies and subsidiaries of The Charles Schwab Corporation and are not affiliated with SIDCO.